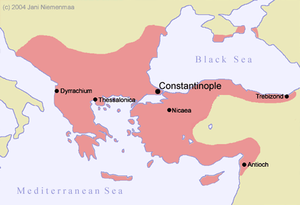 The Byzantine Empire is the term conventionally used to describe the Greek-speaking Roman Empire during the Middle Ages, centered at its capital in Constantinople. Much of this territory had first fallen to Greek rule under Alexander the Great. In certain specific contexts, usually referring to the time before the fall of the Western Roman Empire, it is also often referred to as the Eastern Roman Empire. There is no consensus on the starting date of the Byzantine period. Some place it during the reign of Diocletian (284-305) due to the administrative reforms he introduced, dividing the empire into a pars Orientis and a pars Occidentis. Others place it during the reign of Theodosius I (379-395) and Christendom's victory over paganism, or, following his death in 395, with the division of the empire into Western and Eastern halves. While Constantine I or Constantine the Great (died 337) legalized Christianity, Theodosius declared it to be the state religion. Others place it yet further in 476, when the last western emperor, Romulus Augustus, was forced to abdicate, thus leaving to the emperor in the Greek East sole imperial authority. In any case, the changeover was gradual and by 330, when Constantine I inaugurated his new capital, the process of Hellenization and Christianization was well underway. The name Byzantine Empire is a modern term and would have been alien to its contemporaries. 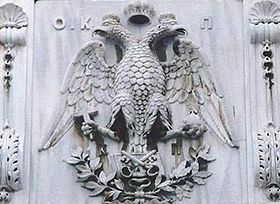 The Empire's native Greek name was Ῥωμανία Romanía or Βασιλεία Ῥωμαίων Basileía Romaíon, a direct translation of the Latin name of the Roman Empire, Imperium Romanorum. The term Byzantine Empire was invented in 1557, about a century after the fall of Constantinople to the Turks, by German historian Hieronymus Wolf (1516–1580). Wolf introduced a system of Byzantine historiography in his work Corpus Historiae Byzantinae in order to distinguish ancient Roman from Medieval Greek history without drawing attention to their ancient predecessors. Standardization of the term did not occur until the seventeenth century, when French authors such as Montesquieu began to popularize it. Hieronymus Wolf himself was influenced by the rift caused by the ninth century dispute between Romans (Byzantines as we render them today) and Franks, who, under Charlemagne's newly formed empire, and in concert with the Pope, attempted to legitimize their conquests by claiming inheritance of Roman rights in Italy thereby renouncing their eastern neighbors as true Romans. The Donation of Constantine, one of the most famous forged documents in history, played a crucial role in this. Henceforth, it was fixed policy in the West to refer to the emperor in Constantinople not by the usual "Imperator Romanorum" (Emperor of the Romans) that was now reserved for the Frankish monarch, but as "Imperator Graecorum" (Emperor of the Greeks) and the land as "Imperium Graecorum," "Graecia," "Terra Graecorum" or even "Imperium Constantinopolitanus." 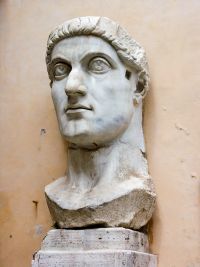 The Donation of Constantine claimed to bequeath to the Pope absolute authority in temporal as well as spiritual affairs, which meant that in the West all political power was in theory delegated by the Pope to the princes. No prince or king could succeed to the throne without papal blessing. Wolf's re-interpretation of Roman history was not intended in a demeaning manner since he ascribed his changes to historiography and not history itself. Byzantium may be defined as a multi-ethnic empire that emerged as a Christian empire, soon comprised the Hellenized empire of the East and ended its thousand year history, in 1453, as a Greek Orthodox state: An empire that became a nation, almost by the modern meaning of the word. In the centuries following the Arab and Lombard conquests in the seventh century, its multi-ethnic (although not multi-national) nature remained even though its constituent parts in the Balkans and Asia Minor contained an overwhelmingly Greek population. Ethnic minorities and sizable communities of religious heretics often lived on or near the borderlands, the Armenians being the only sizable one. Byzantines identified themselves as Romaioi (Ρωμαίοι - Romans) which had already become a synonym for Hellene (Έλλην - Greek), and more than ever before were developing a national consciousness, as residents of Ρωμανία (Romania, as the Byzantine state and its world were called). This nationalist awareness is reflected in literature, particularly in the acritic songs, where frontiersmen (ακρίτες) are praised for defending their country against invaders, of which most famous is the heroic or epic poem Digenis Acritas. The official dissolution of the Byzantine state in the fifteenth century did not immediately undo Byzantine society. During the Ottoman occupation Greeks continued to identify themselves as both Ρωμαίοι (Romans) and Έλληνες (Hellenes), a trait that survived into the early twentieth century and still persists today in modern Greece, but the former has now retreated to a secondary folkish name rather than a national synonym as in the past. 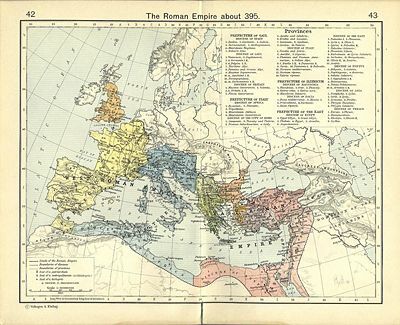 Map of the Roman empire c. 395, showing the praetorian prefectures of Gaul, Italy, Illyricum and Oriens, roughly analogous to the four Tetrarchs' zones of influence after Diocletian's reforms. The division of the Empire began with the Tetrarchy (quadrumvirate) in the late third century with Emperor Diocletian, as an institution intended to more efficiently control the vast Roman Empire. He split the Empire in half, with two emperors ruling from Italy and Greece, each having a co-emperor of their own. This division continued into the fourth century until 324 when Constantine the Great managed to become the sole Emperor of the Empire. Constantine decided to found a new capital for himself and chose Byzantium for that purpose. His victory over his rivals was largely due to his decision, before the Battle of Milvian Bridge, to embrace the then illegal Christian faith. Having inscribed the Chio-Rho monogram (the first two letters of the Greek word, Christ) on his shields, he attributed his victory to Christ's help. The rebuilding process was completed in 330. Although persecuted, Christians represented a sizeable community and it was prudent to gain their sympathy and support. Constantine renamed the city Nova Roma (new Rome) but in popular use it was called Constantinople (in Greek, Κωνσταντινούπολις, Constantinoúpolis, meaning Constantine's City). The Old Rome had pagan origins; Constantine now wanted a new, Christian Rome as capital of what was to be a Christian empire. This new capital became the centre of his administration. Although the empire was not yet "Byzantine" under Constantine, Christianity would become one of the defining characteristics of the Byzantine Empire, as opposed to the pagan Roman Empire. Another defining moment in the history of the Roman/Byzantine Empire was the Battle of Adrianople in 378. This defeat, along with the death of Emperor Valens, is one possible date for dividing the ancient and medieval worlds. The Roman Empire was divided further by Valens' successor Theodosius I (also called "the great"), who had ruled both beginning in 392. In 395 he gave the two halves to his two sons Arcadius and Flavius Augustus Honorius; Arcadius became ruler in the East, with his capital in Constantinople, and Honorius became ruler in the west, with his capital in Ravenna. At this point it is common to refer to the empire as "Eastern Roman" rather than "Byzantine." The Eastern Empire was largely spared the difficulties of the west in the third century and fourth century, in part because urban culture was better established there and the initial invasions were attracted to the wealth of Rome. Throughout the fifth century various invasions conquered the western half of the empire, but at best could only demand tribute from the eastern half. Theodosius II expanded the walls of Constantinople, leaving the city impenetrable to attacks. Zeno I ruled the east as the empire in the west finally collapsed in 476. Zeno negotiated with the Goths, ending their threats to the east but leaving them in control of the west. Map of the Byzantine Empire around 550. Green indicates the conquests during the reign of Justinian I. The sixth century saw the beginning of the conflicts with the Byzantine Empire's traditional early enemies, the Persians, Slavs and Bulgars. Theological crises, such as the question of Monophysitism, also dominated the empire. However, the Eastern Empire had not forgotten its western roots. Under Justinian I, and the brilliant general Belisarius, the empire temporarily regained some of the lost Roman provinces in the west, conquering much of Italy, north Africa, and Spain. Justinian updated the ancient Roman legal code in the new Corpus Juris Civilis, although it is notable that these laws were still written in Latin, a language that was becoming archaic and poorly understood even by those who wrote the new code. Under Justinian's reign, the Church of Hagia Sofia (Holy Wisdom) was constructed in the 530s. This church would become the centre of Byzantine religious life and the centre of the Eastern Orthodox form of Christianity. The sixth century was also a time of flourishing culture (although Justinian closed the university at Athens), producing the epic poet Nonnus, the lyric poet Paul the Silentiary, the historian Procopius and the natural philosopher John Philoponos, among other notable talents. 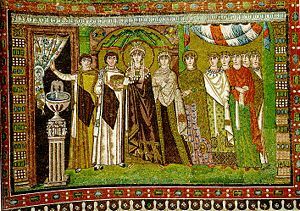 Empress Theodora and her retinue (fresco from Basilica of San Vitale, sixth century). Justinian left his successors a severely depleted treasury, however, and they were largely unable to deal with the sudden appearance of new invaders on all fronts. The Lombards invaded and conquered much of Italy, the Avars and later the Bulgars overwhelmed much of the Balkans, and in the early seventh century the Persians invaded and conquered Egypt, Palestine, Syria and Armenia. The Persians were defeated and the territories were recovered by the emperor Heraclius in 627, but the unexpected appearance of the newly converted and united Muslim Arabs took by surprise an empire exhausted by the titanic effort against Persia, and the southern provinces were all overrun. The Empire's most catastrophic defeat was the Battle of Yarmuk, fought in Syria. Heraclius and the military governors of Syria were slow to respond to the new threat, and Byzantine Mesopotamia, Syria, Egypt, and the Exarchate of Africa were permanently incorporated into the Muslim Empire in the seventh century, a process which was completed with the fall of Carthage to the caliphate in 698. In some places, the Muslim conquest was actually welcomed, and cities were surrendered by non-Orthodox Christians who had little reason to defend rule from Constantinople. The Monophysite Patriarch Benjamin handed Alexandria over in 645. The Lombards continued to expand in northern Italy, taking Liguria in 640 and conquering most of the Exarchate of Ravenna in 751, leaving the Byzantines with control only of small areas around the toe and heel of Italy. Constans II (reigned 641 - 668) divided the empire into a system of military provinces called thémata (themes) to face permanent assault, with urban life declining outside the capital while Constantinople grew to become the largest city in the Christian world. Attempts by the Arabs to conquer Constantinople failed in the face of the Byzantine navy, their monopoly of the still mysterious incendiary weapon Greek fire, the city's strong walls, and the skill of warrior emperors such as Leo III the Isaurian (reigned 717 - 741). After repelling the Arab assaults, the empire began to recover. Although falsely depicted as effete by the historian Edward Gibbon in the eighteenth century, the Byzantine Empire was the closest thing to a military superpower in the early Middle Ages, thanks to its heavy cavalry (the cataphracts), its subsidization (albeit inconsistently) of a well-to-do free peasant class as the basis for cavalry recruitment, its extraordinary defense in depth (the thematic system), its use of subsidies to play its enemies against one another, its intelligence gathering prowess, its development of a system of logistics based on mule trains, its navy (although often tragically under-funded), and its rational military doctrines (not dissimilar to those of Sun Tzu, the Chinese author of the Art of War) that emphasized stealth, surprise, swift maneuver and the marshalling of overwhelming force at the time and place of the Byzantine commander's choosing. After the siege of 717 in which the Arabs suffered horrific casualties, the caliphate was never a serious threat to the Byzantine heartland. It would take a different civilization, that of the Seljuk Turks, to finally drive the imperial forces out of eastern and central Anatolia. However, considerable animosity existed between the Byzantines and the Caliphate. One of the losses had been the Holy City of Jerusalem (638), which had been surrendered by the Patriarch Sophronius (who perhaps had little choice as the imperial army had withdrawn). The loss of Jerusalem, and subsequently control of its sacred sites, dented Byzantine pride. Following the early example of John of Damascus, who described Islam as the 'forerunner of the anti-Christ' and Muhammad as a heretic and pseudo-prophet, negative caricatures of Islam and of Muhammad were common place in the Greek-speaking world. The eighth century was dominated by the controversy over iconoclasm. Icons were banned by Emperor Leo III, leading to revolts by iconophiles within the empire, including John of Damascus. Thanks to the efforts of Byzantine Empress Irene, the Second Council of Nicaea met in 787 and affirmed that icons could be venerated but not worshipped. Irene also attempted a marriage alliance with Charlemagne, which would have united the two empires, thus recreating the Roman Empire (the two European superpowers claimed the title) and creating a European superpower comparable to ancient Rome, but these plans came to nothing. The iconoclast controversy returned in the early ninth century, but was resolved once more in 843. These controversies did not help the disintegrating relations with the Roman Catholic Church and the Holy Roman Empire, which were both beginning to gain more power of their own. For over a thousand years, the Empire represented the continuity of Roman and Greek culture. It unified its subjects with a common sense of identity, values and with an understanding of society as ultimately under God's sovereignty. 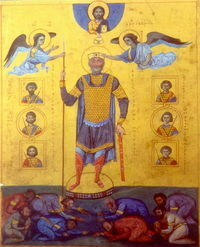 Emperor Basil II the BulgarSlayer (r. 976-1025C.E.). The empire reached its height under the Macedonian emperors of the late ninth, tenth and early eleventh centuries. During these years the Empire held out against pressure from the Roman church to remove Patriarch Photius I of Constantinople, and gained control over the Adriatic Sea, parts of Italy, and much of the land held by the Bulgarians. The Bulgarians were completely defeated by Basil II in 1014. The Empire also gained a new ally (yet sometimes also an enemy) in the new Varangian state in Kiev, from which the empire received an important mercenary force, the Varangian Guard. Like Rome before it, though, Byzantium soon fell into a period of difficulties, caused to a large extent by the growth of the landed aristocracy, which undermined the theme system. Facing its old enemies, the Holy Roman Empire and the Abbasid caliphate, it might have recovered, but around the same time new invaders appeared on the scene who had little reason to respect its reputation. The Normans finally completed the Byzantine expulsion from Italy in 1071 due to an ostensible lack of Byzantine interest in sending any support to Italy, and the Seljuk Turks, who were mainly interested in defeating Egypt under the Fatimids, still made moves into Asia Minor, the main recruiting ground for the Byzantine armies. With the surprise defeat at Manzikert of emperor Romanus IV in 1071 by Alp Arslan, sultan of the Seljuk Turks, most of that province was lost. Although embattled, Byzantine art (especially iconography) and culture continued to flourish. It is widely held that the shape of the Byzantine Bassilica' influenced Islamic architecture, including the Dome of the Rock in Jerusalem built deliberately to rival the splendor of Hagia Sophia. Byzantine art characteristically uses mosaic. Iconography also developed as a major art form. Icons are images of the saints or representations of the Trinity, Mary or Jesus painted according to establish conventions and function as windows to heaven, or a places where heaven meets earth. A partial recovery was made possible after Manzikert by the rise to power of the Comnenian dynasty. 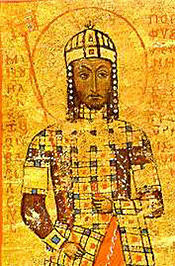 The first emperor of this line, Alexius I, whose life and policies would be described by his daughter Anna Comnena in the Alexiad, began to reestablish the army on the basis of feudal grants (próniai) and made significant advances against the Seljuk Turks. His plea for western aid against the Seljuk advance brought about the First Crusade, which helped him reclaim Nicaea but soon distanced itself from imperial aid. Later crusades grew increasingly antagonistic. Although Alexius' grandson Manuel I Comnenus was a friend of the Crusaders, neither side could forget that the other had excommunicated them, and the Byzantines were very suspicious of the intentions of the Roman Catholic Crusaders who continually passed through their territory. Although the three competent Comnenan Emperors had the power to expel the severely outnumbered Seljuks, it was never in their interest to do so, as the expansion back into Anatolia would have meant sharing more power with the feudal lords, thus weakening their power. Ironically, re-conquering Anatolia may have saved the Empire in the long run. The Germans of the Holy Roman Empire and the Normans of Sicily and Italy continued to attack the empire in the eleventh and twelfth centuries. The Italian city-states, who had been granted trading rights in Constantinople by Alexius, became the targets of anti-Western sentiments as the most visible example of Western "Franks" or "Latins." The Venetians were especially disliked, even though their ships were the basis of the Byzantine navy. To add to the empire's concerns, the Seljuks remained a threat, defeating Manuel at Battle of Myriokephalon in 1176. During the Crusades, the Westerners carved out principalities and counties for themselves, having no intention of handing territory to heretics. When the Crusaders entered Jerusalem (1099) as much Orthodox Christian blood was shed as Muslim. Frederick I, Holy Roman Emperor attempted to conquer the empire during the Third Crusade, but it was the Fourth Crusade that had the most devastating effect on the empire. Although the stated intent of the crusade was to conquer Egypt, the Venetians took control of the expedition, and under their influence the crusade captured Constantinople in 1204. As a result a short-lived feudal kingdom was founded (the Latin Empire), and Byzantine power was permanently weakened. At this time the Serbian Kingdom under the Nemanjic dynasty grew stronger with the collapse of Byzantium, forming a Serbian Empire in 1346. Three successor states were left—the Empire of Nicaea, the Empire of Trebizond, and the Despotate of Epirus. The first, controlled by the Palaeologan dynasty, managed to reclaim Constantinople in 1261 and defeat Epirus, reviving the empire but giving too much attention to Europe when the Asian provinces were the primary concern. For a while the empire survived simply because the Muslims were too divided to attack, but eventually the Ottomans overran all but a handful of port cities. Constantinople was initially not considered worth the effort of conquest, but with the advent of cannons, the walls—which had been impenetrable except by the Fourth Crusade for over 1,000 years—no longer offered adequate protection from the Ottomans. 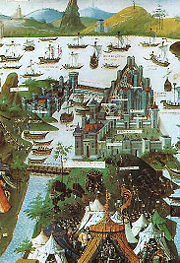 The Fall of Constantinople finally came after a two-month siege by Mehmed II on May 29, 1453. The last Byzantine emperor, Constantine XI Paleologus, was last seen entering deep into the fighting of an overwhelmingly outnumbered civilian army, against the invading Ottomans on the ramparts of Constantinople. Mehmed II also conquered Mistra in 1460 and Trebizond in 1461. Mehmed allowed three days of looting (a custom at the time) then declared a halt. His plan was to preserve and to further extend the city, where he started building projects that included Mosques and starting to construct the Topkapi Palace. He was known for his tolerance of the Christian and Jewish communities who lived in the city. His first act upon conquest was to proclaim the Shahada, the confession of faith in God and the affirmation that Muhammad is God's messenger, in Hagia Sophia—which thereafter functioned as a Mosque. Mehmed and his successors continued to consider themselves proper heirs to the Byzantines until their own demises early in the twentieth century. By the end of the century, the Ottoman Empire had established its firm rule over Asia Minor and most of the Balkan Peninsula. While Europe had stood by and watched the Fall of Constantinople, 1453 came to symbolize a tragic loss in the consciousness of many Christians, bringing what was perceived as the threat of Islam closer. The year 1453 sent shock waves through the Christian world and indirectly led to Christopher Columbus' voyage to the New World. Christian Europe believed that a Christian kingdom ruled by Prester John still existed to the East of Constantinople. If this land could be discovered, then they could attack the caliphate from both sides. The year that Columbus sailed, 1492, saw Jews and Muslims expelled from Spain, possibly in retaliation for the loss of the Christian East (even though this had been regarded as heretical). As the Balkans fell, the Ottomans twice advanced on Vienna, prompting Martin Luther to speculate whether the greatest anti-Christ was the Pope or the Turk. Both rejected the truth. Yet, unless Europe reformed, defeat could follow. Initially, Heraclius had interpreted the rise of Islam in similar terms—it was a God-sent misfortune punishing Christians for disunity and heresy. Meanwhile, the role of the Emperor as patron of Eastern Orthodoxy was now claimed by the Grand Dukes of Muscovy (Moscow) starting with Ivan III of Russia. His grandson Ivan IV of Russia would become the first Tsar of Russia (tsar—also spelled czar—being derived from the Latin “Caesar”). Their successors supported the idea that Moscow was the proper heir to Rome and Constantinople, a sort of Third Rome—an idea carried through the Russian Empire until its own demise in the early twentieth century. 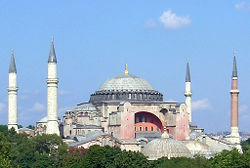 Hagia Sophia as it appears today, featuring wooden minarets that were added during the Ottoman period. The history of Byzantium is a study in disappointment. The empire centering on Constantinople had begun with all the advantages obtained from the inheritance of the political, economic, and intellectual life of the 4th- century Roman empire ... Byzantium added scarcely anything to this superb foundation. The Eastern Roman empire of the Middle Ages made no important contributions to philosophy, theology, science or literature. Its political institutions remained fundamentally unchanged from those which existed ... at the end of the 4th century; while the Byzantines continued to enjoy an active urban and commercial life they made no substantial advance in the technology of industry and trade as developed by the cities of the ancient world. Modern historians of the medieval Eastern Roman empire have strongly criticized the tendency of 19th-century scholars to write off Byzantium as the example of an atrophied civilization. Yet it is hard to find ... any contribution by way of either original ideas or institutions which the medieval Greek-speaking peoples made to civilization. The twentieth century has seen an increased interest by historians to understand the empire, and its impact on European civilization is only recently being recognized. Why should the West be able to perceive its continuity from Antiquity—and thus its intrinsic meaning in the modern world—in so lurid a manner, only to deny this to the “Byzantines?” Called with justification "The City," the rich and turbulent metropolis of Constantinople was to the early Middle Ages what Athens and Rome had been to classical times. Byzantine civilization itself constitutes a major world culture. Because of its unique position as the medieval continuation of the Roman State, it has tended to be dismissed by classicists and ignored by Western medievalists. And yet, the development and late history of Western European, Slavic and Islamic cultures are not comprehensible without taking it into consideration. A study of medieval history requires a thorough understanding of the Byzantine world. In fact, the Middle Ages are often traditionally defined as beginning with the fall of Rome in 476 (and hence the Ancient Period), and ending with the fall of Constantinople in 1453. In commerce, Byzantium was one of the most important western terminals of the Silk Road. It was also the single most important commercial center of Europe for much, if not all, of the Medieval era. The fall of Constantinople to the Ottoman Turks in 1453 closed the land route from Europe to Asia and marked the downfall of the Silk Road. This prompted a change in the commercial dynamic, and the expansion of the Islamic Ottoman Empire not only motivated European powers to seek new trade routes, but created the sense that Christendom was under siege and fostered an eschatological mood that influenced how Columbus and others interpreted the discovery of the New World. Byzantium played an important role in the transmission of classical knowledge to the Islamic world and to Renaissance Italy. Its rich historiographical tradition preserved ancient knowledge upon which splendid art, architecture, literature and technological achievements were built. It is not an altogether unfounded assumption that the Renaissance could not have flourished were it not for the groundwork laid in Byzantium, and the flock of Greek scholars to the West after the fall of the Empire. The influence of its theologians on medieval Western thought (and especially on Thomas Aquinas) was profound, and their removal from the "canon" of Western thought in subsequent centuries has, in the minds of many, only served to impoverish the canon. The Byzantine Empire was the empire that brought widespread adoption of Christianity to Europ—aarguably one of the central aspects of a modern Europe’s identity. This is embodied in the Byzantine version of Christianity, which spread Orthodoxy (the so-called "Byzantine commonwealth," a term coined by twentieth century historians) throughout Eastern Europe. Early Byzantine missionary work spread Orthodox Christianity to various Slavic peoples, and it is still predominant among the Russians, Ukrainians, Serbians, Bulgarians, people of the Republic of Macedonia, as well as among the Greeks. Lesser known is the influence of the Byzantine style of religion on the millions of Christians in Ethiopia, the Egyptian Coptic Christians, and the Christians of Georgia and Armenia. Because the Empire's version of Christianity differed from the West's and because it was perceived as non-European, Europeans tended to denigrate and downgrade its achievements, assuming that Europe was intellectually superior. Robert Byron, one of the first great twentieth century Philhellenes, maintained that the greatness of Byzantium lay in what he described as "the Triple Fusion": that of a Roman body, a Greek mind, and a mystical oriental soul. The Roman Empire of the East was founded on May 11, 330; it came to an end on May 19, 1453— although it had already come into being when Diocletian split the Roman Empire in 286, and it was still alive when Trebizond finally fell in 1461. It was an empire that dominated the world in all spheres of life, for most of its 1,123 years and 18 days. Yet although it has been shunned and almost forgotten in the history of the world up until now, the spirit of Byzantium still resonates in the world. By preserving the ancient world, and forging the medieval, the Byzantine Empire's influence is hard to truly grasp. However, to deny history the chance to acknowledge its existence is to deny the origins of Western civilization as we know it. ↑ Helene Ahrweiler, Les Europeens (Paris: Herman, 2000, ISBN 978-2705664091), 150. ↑ Norman Cantor, Medieval History, the Life and Death of a Civilization (New York: Macmillan, 1963), 248-924. ↑ David Turner, "THE EMPIRE STRIKES BACK" The alternative "History" of Europe Retrieved January 26, 2017. This page was last modified on 27 January 2017, at 20:07.